Have a blissful Valentine's day with this lovely and modern Two Lovebirds confetti. 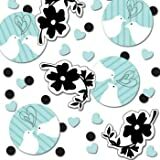 This pack of confetti features small black circles, light aqua hearts, black flowers on white, and white circles with two white lovebirds, blue stripes, and black outline hearts. Perfect for Valentine's Day, Sweetest Day, and weddings! One(1) .5 ounce pack. Tagged Birds, Bridal, Confetti, Love, Shower, Two. Bookmark the permalink.